Heavy-Duty plastic key tags are perfect for permanent identification of keys, luggage, valves, pipes and more. 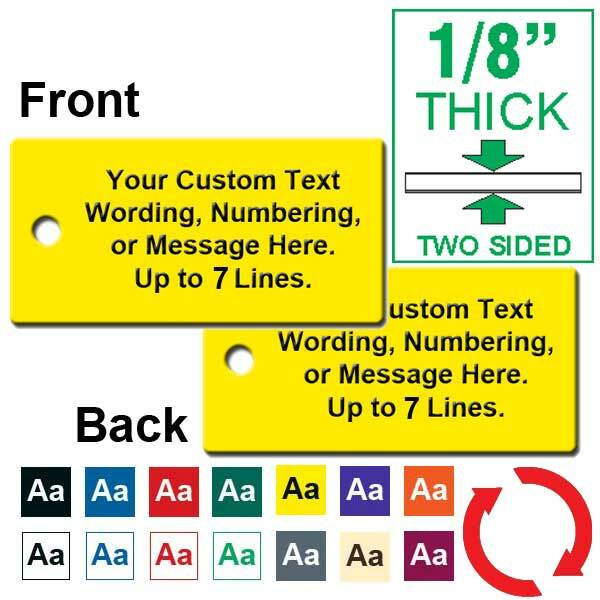 These tags are 1/8" (.125") Thick, 3 Ply (color on BOTH sides) outdoor rated , UV Stable, USA Made engravers plastic for durability and long life. Lettering is engraved by removing the surface color and exposing the core color beneath. Holes are 3/16" (.185") Standard. Sold and priced as EACH, you may mix and match colors / engraving to reach quantity discounts shown. Back Side is same color as the front and can be engraved for an additional charge. Key Ring and Chain Attachments can be added. TAG SIZE: 1 1/4" Tall x 2 1/2" Wide and 1/8" Thick. Max. 24 Characters per line..